Alhamdilliah for the blessings we receive every single day! We are already in the middle of the month, SuhanAllah! 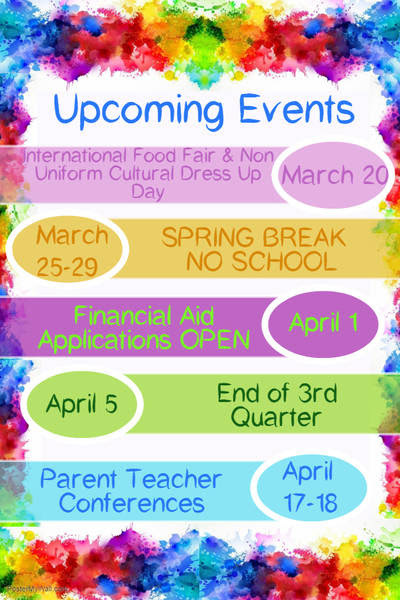 Our school PTO will host an International Food Fair next week on Wednesday March 20th inside ICSD Multipurpose Room starting at 1:30 PM to 4:00 PM iA. Spring Break will be on the last week of March 25th through 29th. School will be closed and classes will resume on Monday April 1st (NON UNIFORM DAY) iA. Parent Teacher Conferences will be on Wednesday and Thursday for both campuses iA. Our school will operate in Short Day Schedule on both days. Further information will be announced in the upcoming weeks iA. We hope you all have a blessed weekend! JAK for your support and cooperation!